Frequently Asked Questions How do I capture the League of Legends game lobby? 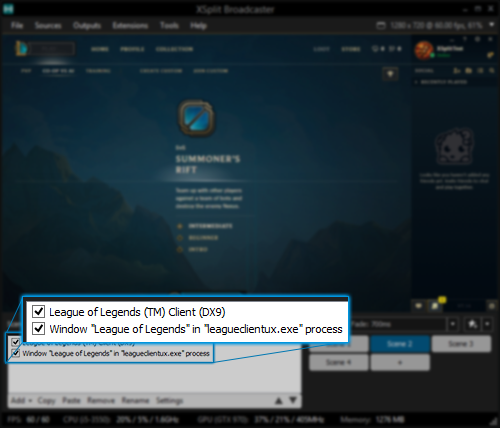 고객지원 > XSplit 브로드캐스터 > Frequently Asked Questions > How do I capture the League of Legends game lobby? After an update, the League of Legends(LoL) game lobby now runs on a web-based client which cannot be captured using Game capture. As a workaround, use Screen capture on the LoL game lobby then add a Game capture > Auto Detect source on top of it to capture the in-game client. This way, you'll be able to record or stream the game lobby and automatically switch to the main game when you start playing.